In the distant future, America is pulverized by a Russian nuclear assault. 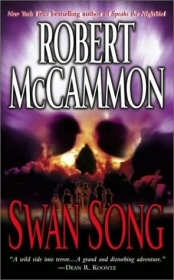 The surviving characters in McCammon’s story consist of a mixed bag of rugged survivalists -- Sister Creep, which roams the unearthed blacktops of New York carrying a bejeweled ring that forecasts the future; Black Frankenstein, which takes shelter in the basement of a gas station in the middle of somewhere far away; and others. Frankenstein’s mission is to protect the child Swan, a girl that plants seeds of hope and is the catalyst to recovery across the war-stripped United States. The Shadow Soldier is one of the most convincing villains in the horror genre, simply because of his link to Colonel Macklin. He is far more profound than a Stephen King ghost bent on terrorizing someone; this entity stems from Macklin’s own haunted psyche. The story hinges on the rise of Macklin’s army set against the pursuit of hope by the novel’s main characters. The Child Swan sews seeds at each town that she and Black Frankenstein (Josh) pass through on their way to their encounter with Sister Creep. Swan bursts with hope so magnificently that the cornstalks sprout from the ground inexplicably. Her miraculous aura is augmented when she comes in the possession of the bejeweled ring -- she dishes out hope in an otherworldly fashion, lessening the buildup of darkness in the novel. Her powers ultimately eradicate Macklin’s army, bringing a sense of progress to the colonies of an earth stripped of everything it resembles. McCammon’s most notable achievement in Swan Song is not this repertoire of hope. It’s his ability to reveal the animal beneath -- the animal determined to survive at all costs. I really loved this book when a teenager, it came to my hands in spanish and I devoured it all in one single day and sleepless night... I used to read a lot Stephen King by then, if comparing in style the only similar book I might point is the one he co-wrote with Straub, The Talisman. I still remember many of the imagery that came up in my head by then as if I was watching a movie, maybe it's not the most original plot, let's face it, but it really is a book of characters that makes you experience the journey through with them, somehow scary but also hopeful. Was Swan Song ever made into a movie??? I've got a little over 200 pages to finish the book and just can't put it down.